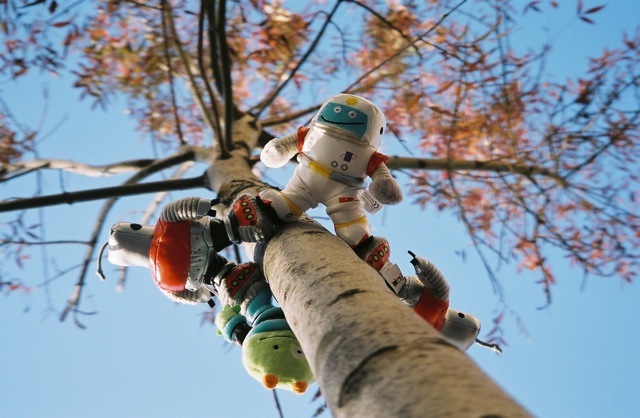 Contrary to popular belief, robots love trees. 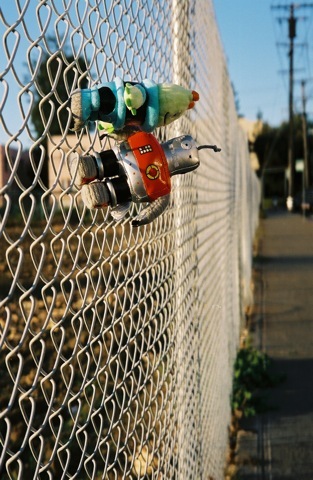 A few years after I finished college, I fell in love with robots. Their feet were magnetic, and I wandered the streets of Berkeley with my camera touching them onto various bits of metal–telephone poles, stop signs, parking meters, construction sites. I got kicked out of libraries and gawked at by strangers. I wandered into lecture halls and old sheds, risked barbed wire and muddied pants. The whole project was unbelievably fun. The photograph: it is an art form so unlike our art form. What we attempt to convey in a page of words, photographers frame and capture in a single shot. Still, I’m fascinated with the way the two arts can and do intersect. And so, in honor of long, lingering Sundays, here’s a handful of photography-inspired writing prompts to help you explore the day. Use a photograph of a loved one and/or another photograph that you love. Write a scene inspired by these photos. Be sure to consider both how you felt back then as well as how you feel now. This one has several steps. Your task is to sink into a single image in order to particularize a world that may not be familiar to you. The challenge here is to move beyond your initial reactions in order to recognize that there is always more to see. First, choose one of the following links (at random!). It will bring you to a photograph. Set your timer for one minute. Do not write anything down. Simply look at the photograph. This part is important. Don’t skip it! Set your timer for 3-5 minutes. Make a list of everything you see. If you run out of things to write, try to particularize the colors and other items in the image. For example, if there is a dog or a tree, try to name the species or breed (without looking things up). If you have no idea the species, try working with comparisons (seems like a cross between a lab and a doberman). The idea here is to dive deep into descriptions. Set your timer again for 15 minutes. Now, write in 1st or 3rd person from the point of view of a bystander. This person should be present at the moment the photograph is taken, but should not be the photographer. This one involves a camera and a walk. Your task? Wander for twenty minutes with your camera poised and ready. Don’t be afraid to let your inner tourist out. Take at least 20 different pictures (that’s a photo a minute). The goal here is to train yourself to see more actively. When you return home, set another timer (can you handle 60 minutes?). Using only your memory of the photographs you have just taken, write about what you saw. Weave the details/images into a scene or a poem. Oh my god!!!! Your robot project is/was amazing! Joy! Joy! Thanks! Lately, I’ve been trying to take photographs, like for-serious take photographs, and I feel like I have the same sort of feeling about writing: when did I lose my sense of whimsy? And, better yet, how can I get it back?